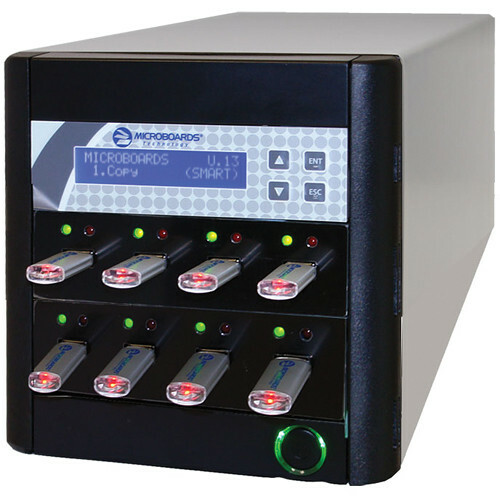 The 1:7 CopyWriter USB Flash Duplicator from Microboards is a standalone device that can copy data from one USB flash drive to up to seven targets, simultaneously. The duplicator supports all current flash drive formats. In addition to copying, the duplicator can also be used to erase content from flash drives. The CopyWriter Flash Duplicator can copy drives of any size. The device copies data at a rate of 10MB/sec. The device operates without the need for a computer or special software. The press of a single button is all that is needed to copy data. All current formats, including FAT16 and FAT32, are supported by the device. You'll be able to format USB flash drives using the convenient erase function. This allows you to remove data from up to seven drives at once. Box Dimensions (LxWxH) 14.7 x 10.1 x 9.5"
Are there any additional functions such as Sanitize HDD and Copies bootable flash drives? You can copy the flash drive, but there isn't an option to Sanitize the hard drive. Does this work with USB 3? Yes, this works with USB 3. I duplicate those regularly. Good little machine. can you shoot HD video from camcorder directly to thumb drive duplicator ? No you cannot. It is a standalone device that can copy data from one USB flash drive to up to seven targets, simultaneously.